Regular posts include market, tech and sector insights from features editor industry journalist Tim Green. We also curate the big new stories each week and regularly report from the show floor of major tradeshows. Download the info pack to find out more or check out the features schedule below. Everything! 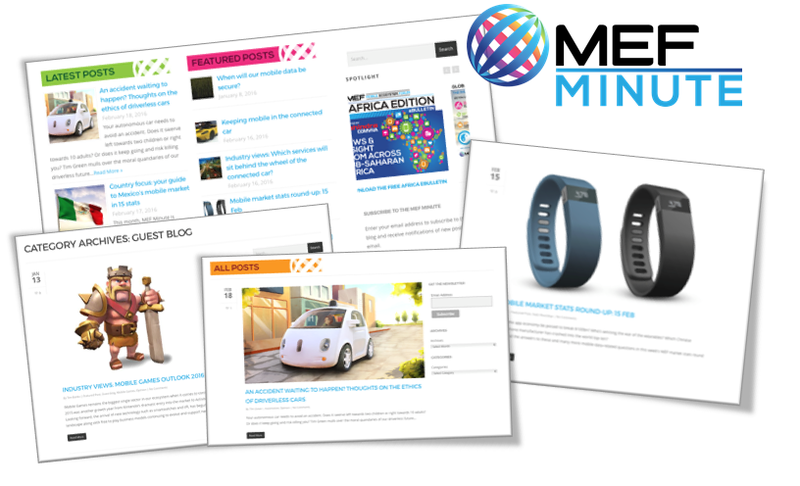 Our members represent the ever-broadening mobile ecosystem and as mobile rapidly becomes consumers’ primary digital channel the sectors engaged or the issues affecting our industry continue to expand and it’s MEF Minute’s job to provide news, insight and analysis across the ecosystem. MEF’s key initiatives include Messaging, Consumer Trust (Privacy & Security) and Mobile Money so we are always keen to have strong content discussing these key areas. In addition we look at different sectors from Retail to Automotive and from mHealth to Fintech and work hard to ensure that our news and views cover as many markets as possible to give readers greater insight into local issues and opportunities. Popular topics also include IoT, authentication, analytics, mobile advertising, user retention and customer loyalty. Check out editorial guidelines to help you submit a featured guest contribution, ranging from brief Member profiles to long-form opinion pieces. Download the guides below. We accept contributions from members and non-members across the range of formats available on the MEF Minute including opinion pieces, industry views, video interviews and infographics. MEF Minute offers a 360 look at any given topic whether that be from a MNO, enterprise, developer or provider perspective.